Act 2. Lauren Cuthbertson (Sugar Plum Fairy); Federico Bonelli (The Prince); members of the London Oratory Junior Choir (Singers); Christina Arestis, Johannes Stepanek, Tara-Brigitte Bhavnani, Fernando Montaño, Tierney Heap and Eric Underwood (Spanish Dance); Itziar Mendizabal, Ryoichi Hirano, Reece Clarke, and Nicol Edmonds (Arabian Dance); Luca Acri, Marcelino Sambé (Chinese Dance); Kevin Emerton and Paul Kay (Russian Dance); Meaghan Grace Hinkis, Emma Maguire, Mayara Magri, and Leticia Stock (Dance of the Mirlitons); Yuhui Choe (Rose Fairy); Matthew Ball, James Hay, Tomas Mock, Valentino Zuccheti (Rose Fairy Escorts); Claire Calvert, Helen Crawford, Hikaru Kobayashi, and Beatriz Stix-Brunell (Leading Flowers). In addition, artists of The Royal Ballet and students of the Royal Ballet School portray Snowflakes, Relatives, Friend's of Stahlbaum family, Soldiers, Mice, Servants, Children and other roles. I did a detailed review of this same production (with an earlier set of star dancers) in 2013. I gave it a B and declared it not competitive with stronger competition. I went on to say, "The Peter Wright production could be competitive again if the Royal Ballet would revive it with (1) new sets and costumes, (2) drill the female corps more thoroughly, (3) write new divertissement dances, and (4) make a clean, bright video." 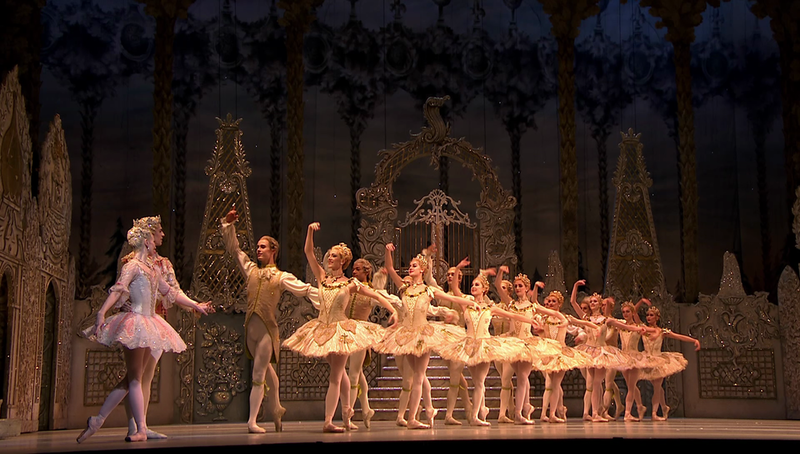 Now we have our revival, so let's see how the Royal Ballet has done by The Nutcracker between 2009 and 2016. At the outset I'll say that the choreography, sets, and costumes are basically identical in 2009 and 2016 except that in Act 2 the 4 rather insipid Chinese dancers from 2009 are reduced to 2 in 2016. Now let's look at 7 screenshots from the 2016 Act 1 showing the Stahlbaums' party and Clara's dream. For each of these 7 shots there is a doppelgänger in the 2009 review for you to compare if you like. And the dream battle upfolds the same. If you compare these 7 shots from 2009 and 2016, you can clearly see that MacGibbon has better cameras in 2016 than before. The 2016 images are sharper and MacGibbon was able to get better color even in the dark scenes. The generally "washed out" look from 2009 is gone. In my 2009 viewing, I complained that the costumes looked old and worn. Now I see that my criticism of the costumes arose in part because the 2009 cameras generally were not able to make pretty images of them. Another difference between 2009 and 2016 is that MacGibbon in 2016 generally increased the range of his camera views throughout. He was able to do this, of course, thanks to the greater resolution available from the 2016 gear. So this time the ROB has produced the "clean, bright video" I asked for. Most of Act 2 takes place in the Sugar Garden in the Kingdom of Sweets. The female corps dances in 2016 with more precision than in 2006. 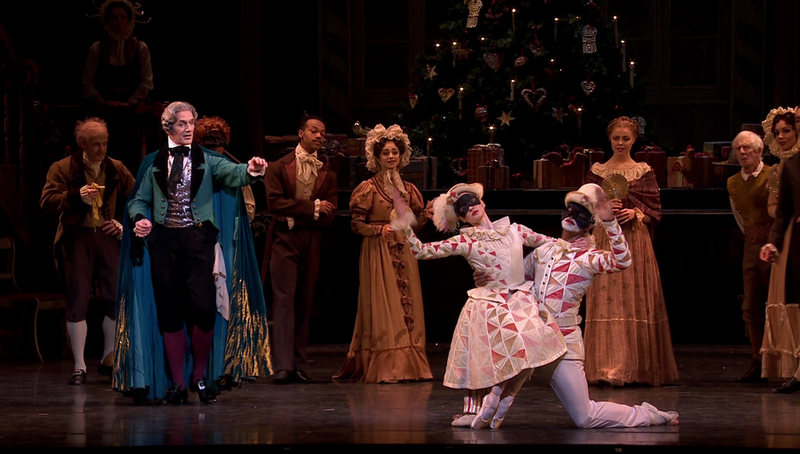 I conclude that the 2016 Nutcracker is clearly stronger than the 2006 version with a much prettier video, better corps dancing, and more vivid sound. But the sets and costumes are the same and the divertissement dances are sadly obsolete. A distinct element of DVDitis remains in MacGibbon's video content. And after the ROB made their 1st video of the Peter Wright production in 2006, 3 other strong and fresher Nutcrackers entered the market made in Amsterdam, Vienna, and Berlin. So I'll give subject 2016 version another B (the 2006 Peter Wright disc should be marked down now to a C, but I will leave it at a B also).